Great for clubs, events, teams, organizations, camps, schools, family reunions and more! Eliminate the hassles of order forms, collecting money and distribution. your online order form with your custom designs. your link to students, collegues, employees, friends or family via social media or email. sizes and payment via our online payment system. is placed for your branded items. orders with our shipping team either in bulk or to specified locations. Quality Custom Apparel Printing and more from T-shirts to Sweatshirts to Activewear, we've got you covered....literally. 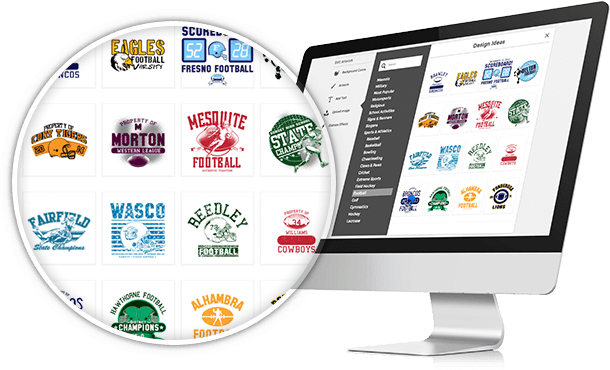 From Company Stores, Sports Clubs, Schools, to designers or charities MyShirtBuzz has a solution. Using your organizations logo and designs we can showcase them on a number of products including T-Shirts, Apparel and other marketing promo items. Select the items that you want from hundreds of products including t-shirts, sweatshirts, jackets, hats, team apparel, water bottles, gym bags, umbrellas, towels, blankets and more. Submit camera-ready logos, choose from more than 30 pre-designed styles clip art or request our design team to help you create something new. We offer a full range of decorating including embroidery, appliqué, heat transfers, screen-printing and direct-to-garment printing. We also use specialty metallic inks and bling if you'd like! Add your new online store link to your website and Facebook page. Start emailing out the link and marketing it to drive traffic to your store! Need help? We can do that too…just ask! Create awareness of causes important to you by offering custom apparel via an online fundraising storefront. Make the most of your fundraising campaigns by defining goals. Goals can be an important driver of urgency and sales. You can choose between number of units or a dollar amount sold goal. Total sales can be showcased on your custom online storefront. You can define the ordering timeline to ensure orders are placed quickly by your audience. A timeline helps to reinforce the available ordering period and increases purchase urgency that often can help expedite sales. Maximize fundraising results by clearly communicating the details, goals, and value of the fundraising campaign. You can define a title and a description to display prominently on the fundraising store’s homepage. It’s easier than ever to offer your customers and prospects online fundraising stores. Setting up an MyShirtBuzz Powered Fundraising Web Store is quick and easy thanks to our intuitive fundraiser creation process. Powered fundraising web stores come with responsive themes that are optimized for every possible layout and screen resolution. Whether your shoppers view your site from a tablet, smartphone desktop or laptop, your website displays perfectly. Great for family events, bridal parties, reunions and more! Jump into our Design Studio and start creating your custom look and feel. DO IT YOURSELF in our Design Studio! 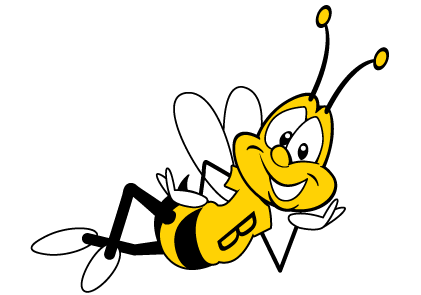 Our goal is simple: Making it easy to help you spread the "Buzz!" What's the Buzz? It's the spirit, love and pride you have for that special event, school, charity, company or organization. 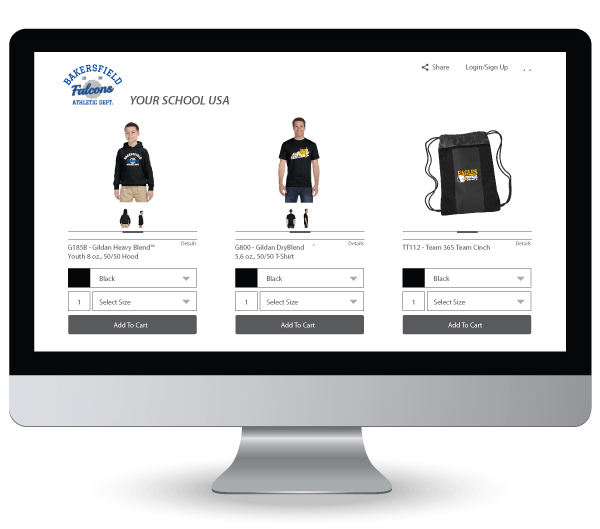 Through your branded merchandise you can show that off to everyone you know and if you like, you can help your school or organization raise funds while you’re at it! Having been in the apparel and branded merchandise business for many years, we saw the need to bring technology to the T-Shirt business. Our task is to help teachers, parents and businesses streamline their order processing so they can focus on more important parts of their jobs! We have listened to our clients - the parents, grandparents and family members who want to share in the spirit and purchase spirit wear for their youngsters. Now, they have the opportunity to log in to your customized, online storefront 24x7/365 from anywhere and buy whatever they want at your very own Buzz Store! MyShirtBuzz is all about what's important to you. Whether it is your school, team, fundraiser or event, we'll help you share YOUR Buzz! "I wanted to say that this was THE BEST thing that I have ever done. Everything was amazing. With the one issue I had heard of from a parent, you fixed it right away! Thank you so much." "It was awesome...very easy and quick..."
“Anyone can order a shirt, but what sets myshirtbuzz apart is its customer service. From project management to production, they help you every step of the way with no guesswork!"